(Last Updated : 21.01.19). 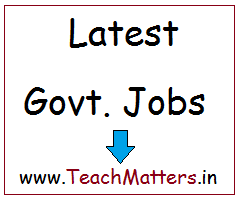 Check latest Delhi Guest Teacher Recruitment 2019 Online Application, Result, Merit List, Document Verification Schedule for EVGC, PGT, TGT, Primary Teacher, Assistant Teacher Nursery and Urdu. Directorate of Education, Delhi Govt. invited online application for engagement of PGT/Lecturer, TGT, Misc. Teachers (Physical Education, Drawing, Music, Domestic Science, Special Education Teacher) & Educational and Vocational Guidance Counselors (EVGCs) in Delhi Government Schools for the year 2018-19 as per the schedule. The Dept. invited online application for Contract Basis Teacher (PRT-TGT) Recruitment 2018-19. Latest Circular regarding publication of final merit list of Delhi Guest teacher recruitment for 2018-19 has been released on 02.01.2019. Earlier, Directorate of Education, New Delhi Municipal Committee (NDMC) extended last date for online application for engagement of Guest Teachers for the post of PGT, TGT, PRT, Assistant Teacher Nursery & Urdu in NDMC Navyug schools for the session 2017-18. See latest news about Delhi guest teacher recruitment for the session 2019-20 for PRT, TGT, PGT/Lecturer, EVGC through www.edudel.nic.in along with advertisement, document verification, merit list, result and appointment letter etc. Result of Delhi Guest Teacher Merit List 2017-18 can be checked here. The Result of Delhi Guest Teacher Engagement 2017-18 for the post of Guest Teacher & EVGCs Teacher is declared on the basis of Merit List and cut-off marks of each post and category which has been published/displayed by the department in the respective district as per the schedule. Latest Updates on 21.01.2019 : Delhi Guest Teacher Merit List 2019 for TGT Subject-Specific Teacher Engagement for 2018-19 has been released on 21.01.2019 for various districts. Delhi SCERT invites online applications for Guest Lecturers Recruitment 2018-19 in Delhi DIETs & SCERT. You can check here latest merit list and result as and when the merit list is published on the official website. Directorate of Education, Govt. of NCT of Delhi & UEE Mission of SSA Delhi invited online application for recruitment of Delhi guest/Contract Teachers for engagement of Primary School Teacher & Subject Specific Teachers (TGT) for the year 2019. Eligible candidates can apply online for Delhi Guest Teacher as per the schedule given below. Here you can see latest guest teacher recruitment news 2019. Delhi Guest Teacher Recruitment 2019 is advertised and published on 04.01.2019. Here is the details of PRT & TGT Guest Teacher Recruitment 2019. (i) Senior Secondary School (Class Twelve) (Nursery) certificate or Intermediate or its equivalent from a recognized Board/University. (ii) Diploma/certificate in Elementary Teacher Education programme or a duration of not less than two years or B.E.Ed. from a recognized Institute. (iii) Must have passed Hindi at Secondary level. Candidates who want to apply for Delhi Contract Teacher posts of Primary School Teacher can apply online through official website of Department of Education, GNCT of Delhi i.e. www.edudel.nic.in from 05.01.2019 to 13.01.2019 (06.00 P.M.). Note : Candidates are advised to apply only in one district for a given post otherwise their application will be cancelled. Bachelor Degree in the Subject Concerned from a recognized University or Institution with B.Ed with right combination of two subjects in B.Ed. Other Qualification as per Recruitment Rule. Candidates who want to apply for Delhi Contract Teacher posts of Trained Graduate Teacher can apply online through official website of Department of Education, GNCT of Delhi i.e. www.edudel.nic.in from 05.01.2019 to 16.01.2019 (06.00 P.M.). The Department issued a notice regarding redeployment of Guest Teachers for 2018-19. Guest Teachers who have worked in previous Academic Sessions 2016-17 & 2017-18 and relieved on account of joining of regular teacher/surplus due to PFC may be redeployed for Academic Session 2018-19 on priority basis on vacant post, only as per requirement in school. Here is the complete detail. Directorate of Education, Govt. of NCT of Delhi invited online application for recruitment of Delhi guest/Resource Teacher for engagement of Lecturer/PGT/TGT for the year 2017-18. Eligible candidates can apply online for Delhi Guest Teacher as per the schedule given below. The department invited online application form amongst the qualified youths for engagement of Nursery Guest Teachers in Delhi Government Schools for the year 2017-18. Interested and eligible retired teachers can apply online application as per the schedule given below. Name of the Department : Directorate of Education, Delhi Govt. Assistant Teacher Nursery : Rs. 1000/- per working day. (i) Senior Secondary School (Class Twelve) (Nursery) certificate or Intermediate or its equivalent with at least 45% marks from a recognized Board/University. (ii) Diploma/certificate in Nursery Teacher Education programme or a duration of not less than two years or B.Ed. (Nursery) from a recognized Institute. Candidates who want to apply for Delhi Contract Teacher posts of Assistant Teacher Nursery can apply online through official website of Department of Education, GNCT of Delhi i.e. www.edudel.nic.in from 29.01.2018 to 05.02.2018 (06.00 P.M.). Note : For other details like eligibility criteria, selection process etc. read the advertisement. The Education Department on 30.11.2017 invited online application from among retired teachers Government Schools of Directorate of Education (DoE) /DoE Aided Schools /Central Govt. & Local Bodies of Delhi on hourly basis for engagement of Resource Teachers of PGTs & TGTs in Delhi Govt. Schools for the year 2017-18. Willing candidates may apply online through official website i.e. www.edudel.nic.in from 01.12.2017 to 07.12.2017 (06.00 P.M.). The school-wise order of merit list will be displayed on 15.12.2017. Rs. 700/- per period for PGTs & Rs. 500/- per period for TGTs. Candidates who want to apply for Delhi Resource Teacher posts of PGT & TGT Teacher can apply online through official website of Department of Education, GNCT of Delhi i.e. www.edudel.nic.in from 01.12.2017 to 07.12.2017 (06.00 P.M.). Applicant who have already applied in response to earlier Advt. dated 15.11.2017 need not apply again. Candidates are advised to read the detailed notification before applying online for these posts. The department invited online application form amongst the qualified youths for engagement of PGTs and TGTs in Delhi Government Schools for the year 2017-18. Interested and eligible retired teachers can apply online application as per the schedule given below. PGT : Rs. 1445/- per working day. TGT with CTET : Rs. 1403/- per working day. Misc. Teachers : Rs. 1050/- per working day. For PGT : Post Graduate Degree in the Subject Concerned from a recognized University or Institution with B.Ed. For TGT : Bachelor Degree in the Subject Concerned from a recognized University or Institution with B.Ed with right combination of two subjects in B.Ed. For Misc. Teachers : Bachelor Degree in the Subject Concerned from a recognized University or Institution with required Diploma for the specific post. Candidates who want to apply for Delhi Contract Teacher posts of PGT & TGT Teacher can apply online through official website of Department of Education, GNCT of Delhi i.e. www.edudel.nic.in from 26.05.2017 to 15.06.2017 (06.00 P.M.). Disclaimer : This recruitment notification is based on the notice available on the official website. So candidates are advised to check the official notification uploaded on the official website whose link is given below. For other information regarding age limit, vacancy details, eligibility & qualification criteria etc. download the detailed advt. notification available at official website. The Department on 14.06.2017 issued a circular regarding 'Correction in Educational Qualifications' in Guest Teacher Online Application Form. A large number of applications are being received by the Department regarding correction in online application form. Therefore, the Department has decided to open a link for making correction in online application form (Educational Qualification only). Those applicants who want to make corrections in their Educational Qualifications in online application can go to the link provided at www.edudel.nic.in for making online corrections. This link will be available up to 19.06.2017 (6.00 p.m.). Directorate of Education, NDMC invited online application for recruitment of Delhi guest Teacher for the post of PGT/TGT for the year 2017-18. Eligible candidates can apply online for Delhi Guest TGT Teacher as per the schedule. The last date for submission of online application was extended up to 25.03.2017. Check latest updates on New Delhi Municipal Council Guest Teacher Recruitment 2017-18. Here you can see latest guest teacher recruitment news 2017-2018. Delhi Guest Teacher Recruitment 2017 was advertised and published on 12.05.2017. Here is the details of EVGCs Guest Teacher Recruitment 2017-18. Rs. 1445/- per working day. Diploma in Guidance and Counseling from a recognized University or Institution. Desirable - One year experience in Guidance and Counseling in a Central or State or UT Government Institution/Public Sector Undertaking. Candidates who want to apply for Delhi Contract Teacher posts of EVGCs Teacher can apply online through official website of Department of Education, GNCT of Delhi i.e. www.edudel.nic.in from 13.05.2017 to 03.06.2017 (06.00 P.M.). I want to apply for Computer science teacher, i have done Btech in CS, Am i eligible for this? i want to know that who will get higher rank in merit?? the one who has more experience or the who has higher qualification..
why ctet roll no tab is not working? m bhi ctet roll no enter nhi kr pa rha hu. Were you able to fill the Sr. Secondary passing year and board? if yes, please share how. I am also facing the same issue. today is the last date to fill the form and i m unable to fill the form because 19(b) and 19(c) column is not working . Error found in application form....any suggestions? List kb tak aane ke chances h koi idea??? Frnz kisi ko ye pata h ki merit kis base par calculate hogi kese 10th+12th+b.a+b.ed+m.a ke marks calculate hoge tgt pgt k liye??? Suppose that mere percentage 58%+62%+55%+61%+64% hai to mere kitne percent banege? Kisi ko kuch pata hai ki merit list kab aaegi? I forgot to take print out of my filled form ! Now the dates are over , what to do ?? Delhi guest teacher vacancy kb aygi 2018 me..